Thank you all so much for your incredible support, both over the years and, more specifically, during this very exciting week. I am overwhelmed. One journey is over, and another is just beginning. The jury's still out on which will ultimately be more demanding. Is it more difficult to stay focused over an extended period of slow steady work, or during a few short months of furious pace? I guess I'll let you know! But in case I get bogged down in this or that, I wanted to give you a short laundry list of what you'll soon see announced -- if for no other reason than to slightly stem the tide of questions. Actually, this is just a typical marketing phase. And in that world information is dispensed at a very specific rate. We always forget -- and yes, I do mean "we" since I'm as guilty of this as anyone -- but marketing is seldom directed at the pre-informed/pre-sold audience. The marketing team behind this book doesn't need to focus too intently on the LOTR/film music crowd. We know why this music matters. It now needs to reach the uninitiated. They know how to do that, and I'm quite content to let them do their jobs unhindered by my pestering. That means I'm not always privy to dates and timelines, but that's OK. I've been told that August will be a quieter month for us, then September will kick us back to high gear. However, for "we" the dedicated, I'll soon be updating the FAQ to explain a few things. I think there's still plenty to be said about the Rarities disc and how decisions were made -- the track titles alone aren't going to tell you that. It's a fascinating collection of materials you've never heard before at all, materials that you've heard before in part, pieces that never made it to the CRs, early versions of themes and compositions, etc. You'll see. I really love it because it works both as an archive -- something you can study to gain a greater understanding of Shore's creative process -- and as a beautiful album -- something you can pop in the car for a long ride. But more on that at the appropriate date. I also want to give you a little information on the book's content and sections. Does it include the material from the liners? The Annotated Score? All new material? (1. Yes, thoroughly expanded; 2. Yes, expanded and restructured; 3. Yes, quite a bit!) The upcoming preview pages will make this a bit clearer as well, and those are coming soon. -If you wish to have a book signed at the event in London on September 27, you will probably need to buy your book at the event itself. A pre-ordered book shouldn't be able to reach you beforehand since the book won't actually be in wide release until the day after this event. -If you're hoping to have a book signed at the B&N event in NY on October 7, you probably have a little more leeway. Technically, our US street date is two days before this event. If you trust shipping times -- and if said times coincide properly with your own travel plans -- pre-order away. -If you're hoping to have a book signed at either the RAH or RCMH concerts, you may be safe placing a pre-order or swinging by an old brick-and-mortar, so it's your call. We will have the book available at the concerts themselves, so take that into consideration. And that's pretty much what I know at the moment. It's an incredibly rewarding, exciting, nerve-wracking time for me, but I wouldn't trade it for the world. Oh yes, I should mention ... This Tuesday morning I received an email from Shore's office. "Let us know when you receive yours today." Somewhat confused I stumbled out to the porch. At some point during the night or early morning a delivery had been made. I opened up the box, for the first time ever, held the finished book in my hands. That's just one of a thousand moments I'd never have had without your support. I can never, ever thank you enough. (July, 28, 2010—New York, NY) Carpentier and Alfred Music Publishing are pleased to announce the release of The Music of the Lord of the Rings Films, a comprehensive account of Howard Shore’s score for the trilogy, by Doug Adams. The book will be available in the European Union on September 28 and in the U.S. and worldwide on October 5, 2010. 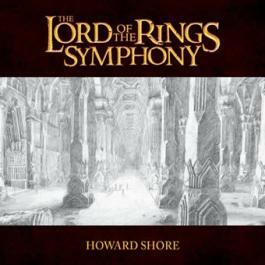 The culmination of almost a decade of writing and research, The Music of the Lord of the Rings Films is an unprecedented look at Howard Shore’s Academy Award®-winning score, with extensive music examples, original manuscript scores, a rarities CD, and glimpses into the creative process from the composer, himself. The score for The Lord of the Rings film trilogy has been hailed as some of the greatest film music ever written. Sweeping in scope, it is a musical interpretation of J.R.R. Tolkien’s Middle-earth—an operatic tapestry of cultures, histories, languages, and people. The Lord of the Rings Symphony is set to record this February in Luzern, Switzerland with the 21st Century Symphony Orchestra and the 21st Century Chorus. Additional details are yet to come, including conductor, soloists, release date, and format. But the wheels are in motion! As we prepare to enter the world of press releases and higher visibility, your humble behind-the-scenes crew has decided to finally fix one thing we never really liked about this whole project ... namely, the URL for this blog! It's actually become a bit of a running joke for us, to the point that we all groan and chuckle in concert when asked for the blog address. Once you've actually navigated your way through three 'the's, and if you can actually remember the 'films' at the end, oh and that 'dot-blogspot' before 'dot-com' ... let's just say that graceful memorability was not exactly achieved. The old address will still work for a little while longer, and after that an auto redirect code will kick in and automatically bump you to the new URL. So it's up to you, you can either update your bookmarks, or mark your 'loyal reader' status by keeping your browser pointed at the old finger-busting address. As for comments, Disqus is already installed and ready to go at the new address. Old comments are in the process of migrating over. They're all available at Disqus.com right now, and I'm told they will be popping up on the new versions of old posts in the coming days. If anything seems to be misfiring, or if there's something specific you'd like to see incorporated into the blog, please feel free to click the Email button at top right and make your voice heard. Between press releases, preview pages, order sites, book signings, etc., there's plenty being planned right now, but I want to be certain the blog doesn't get lost in the shuffle. I'm still told our first batch of announcements will run before July is over, so I want to make sure our home on the internet is in tiptop condition for the big day! This news is slow 'round these parts, as we wait on press releases and website development. But rest assured, the behind-the-scenes scurrying continues! In the meantime, I found this on deadline.com today. As Peter Jackson continues his own behind-the-scenes battles in order to bring The Hobbit to life, I thought perhaps it would be appropriate to witness one of his very very battles. This comes from BAFTA's recent tribute for stop-motion wizard Ray Harryausen. It features Jackson's teenaged attempt to create his own stop-motion duel. Enjoy! 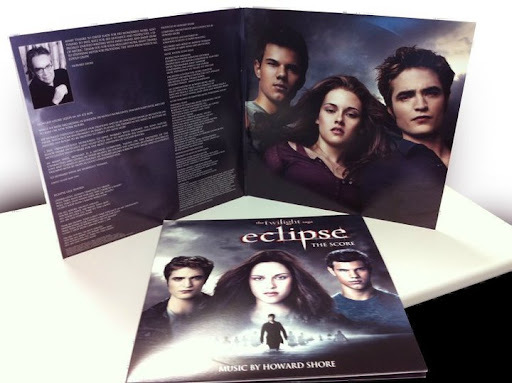 Vampire-vigilant Alex has sent in a great shot of the vinyl release of Howard Shore's Eclipse score. I mostly missed the halcyon days of vinyl, but hold enough foggy half-formed memories of the era that this image really takes me back. Gracias, Alex! You may have already seen this in a recent Tweet, but tickets are now available for the Saint Louis Symphony Orchestra's April 2011 performances of The Fellowship of the Ring: Live to Projection. The Saint Louis Symphony is a topflight orchestra that has flourished under music director David Robertson during the past decade. Robertson has brought a wonderful contemporary bent to the ensemble, which should serve Shore's score very well indeed. This should be an amazing series of performances. Were I not already scheduled to be in Switzerland, I'd be there with bells on! I expect the book to be there in my stead. 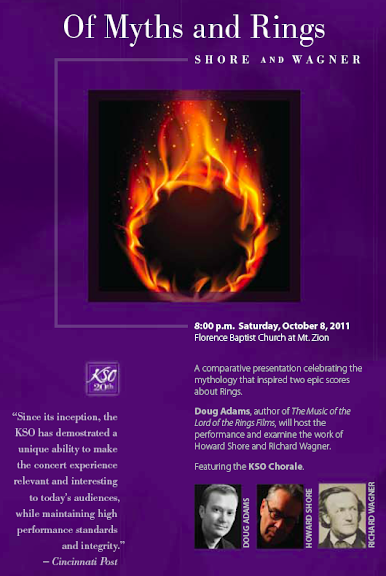 Those of you who missed last year's RCMH performances of Fellowship would do well to check out the SLSO shows. Tickets are available here. With press releases, pre-orders, and (potentially) some Hobbit/MGM news due this month, I think we'll have plenty to discuss as the summer heat begins to beat down!